Drink it daily if needed as a coffee replacement. It is a no-brainer during the cold and flu season and the perfect delicious drink when cleansing and detoxing. 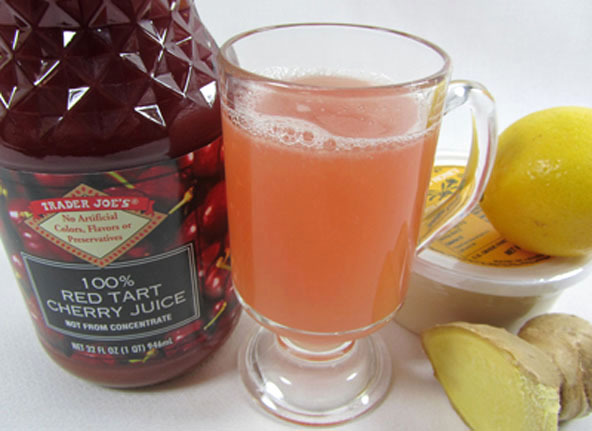 Ginger, Lemon, Tart Cherry and honey are all extremely good for your immune system. This tea acts like an expectorant and reduces nasal congestion. This is a perfect drink to warm you up when you have the chills (especially when you add a pinch of cayenne pepper). Just be sure to rinse your mouth well with water immediately after drinking lemon juice or your teeth will become too clean and sensitive over time. Put the tea in a thermos to keep it hot if desired or drink it cold if you like. It’s even a great party drink if you add just the right amount of honey or sweetener of choice. ¼ cup of tart cherry juice, not from concentrate (optional) – very cleansing, extremely high in antioxidants and a pain reliever. 2 tsp to 2 Tbsp of raw honey or whole sweetener of choice depending on taste (do not give honey to children under 12 months old. I like to use 3 dates, pitted and pureed or 7 drops of stevia and 2 tsp of honey. Add a pinch of cayenne powder (this will help warm you up if needed. It doesn't take much to make you sweat so use sparingly). or a strip of any sea vegetable. Seaweed is a superfood packed full of extra vitamins and minerals. or a few cloves of fresh garlic, minced or blended. Put purified water in a teapot to heat to hot but not boiling. If it boils, let it set for a few minutes to bring the temperature down a bit. Do not heat over 118 degrees for Raw-Wholetarians. Use a magic bullet type of blender. The blender needs to be small like the magic bullet because the batch is so small. If you don't have a blender, you can mince the gingerroot instead. Add the lemon juice, tart cherry juice (if using) and the gingerroot piece (and dates if using) to the blender and blend until it is a liquid. Pour mixture into a large quart size jar or pitcher and add the 2 cups of warm water. Steep for a few minutes if you used minced gingerroot instead of blending it. Add the raw honey (if using honey). Stir until the honey is dissolved. Start with a small amount and add more later if needed. Taste and make adjustments if desired like adding a drop or two of stevia or more water. You may want to strain out the minced ginger or fibers from the blended ginger. This is optional but not preferred. Avoid using plastic straws. Not only will the hot tea leach plastic from the straw and into your body but they add to needless waste. Reusable healthy glass or stainless steel alternative straws are found on Amazon. These straws are great at keeping the lemon juice off of your teeth.